Leaves and fruits of Phyllanthus emblica L. have been used for the anti-inflammatory and antipyretic treatment of rural populations in its growing areas in subtropical and tropical parts of China, India, Indonesia, and the Malay Peninsula. In the present study, leaves of Ph. emblica were extracted with ten different solvents (n-hexane, diethyl ether, methanol, tetrahydrofuran, acetic acid, dichloromethane, 1,4-dioxane, toluene, chloroform, and water). The inhibitory activity of the extracts against human polymorphonuclear leukocyte (PMN) and platelet functions was studied. 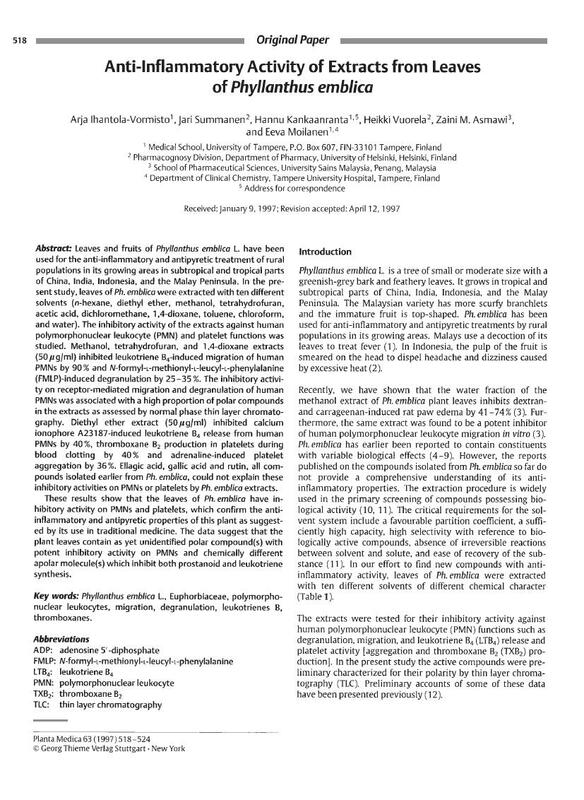 Methanol, tetrahydrofuran, and 1,4-dioxane extracts (50 µg/ml) inhibited leukotriene B4-induced migration of human PMNs by 90% and N-formyl-L-methionyl-L-leucyl-L-phenylalanine (FMLP)-induced degranulation by 25-35%. The inhibitory activity on receptor-mediated migration and degranulation of human PMNs was associated with a high proportion of polar compounds in the extracts as assessed by normal phase thin layer chromatography. Diethyl ether extract (50 µg/ml) inhibited calcium ionophore A23187-induced leukotriene B4 release from human PMNs by 40%, thromboxane B2 production in platelets during blood clotting by 40% and adrenaline-induced platelet aggregation by 36%. Ellagic acid, gallic acid and rutin, all compounds isolated earlier from Ph. emblica, could not explain these inhibitory activities on PMNs or platelets by Ph. emblica extracts. These results show that the leaves of Ph. emblica have inhibitory activity on PMNs and platelets, which confirm the anti-inflammatory and antipyretic properties of this plant as suggested by its use in traditional medicine. The data suggest that the plant leaves contain as yet unidentified polar compound(s) with potent inhibitory activity on PMNs and chemically different apolar molecule(s) which inhibit both prostanoid and leukotriene synthesis.